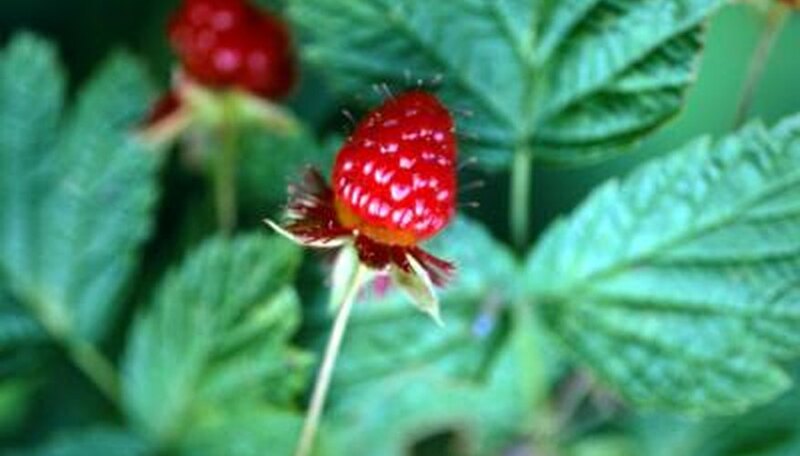 Raspberry bushes are extremely susceptible to damage from beetles. Although a raspberry plant grows well in a variety of soil types and growing conditions, insect pests can prevent the bush from putting out a healthy crop of berries. Keeping raspberry bushes healthy is key to encouraging the production of berries each fall. Japanese beetles are a major threat to raspberry bushes. These beetles have a voracious appetite for the flesh of the raspberry's leaves, and a serious infestation can defoliate a whole plant over a short period of time. Raspberry cane borers are another beetle that feeds on the young cane tips of raspberry bushes, according to the North Dakota State University website. These beetles lay eggs in the raspberry bush, and larvae weaken it further. Pheromone traps are useful for drawing Japanese beetles away from a plant. These traps release a scent that draws the beetle to the trap, from which they cannot escape. However, beetles will feed on the plants between the host plant and the trap, so it is best to put the pheromone trap in an area of the garden where other plants are less likely to be damaged. Physical removal and destruction of Japanese beetles also helps protect the raspberry bush. Raspberry cane borers have the potential to girdle and destroy young raspberry canes, which is both expensive and detrimental for orchard growers and individual gardeners. Pesticides designed to attack the adult and larval forms of raspberry cane borers are useful for controlling infestations before they cause problems. The North Dakota State University website recommends spraying the pesticide before the blossoms emerge, as well as removing infested canes several inches below the obviously wilted portions. Controlling the presence of insects on a raspberry plant is important throughout the growing season. Regular applications of pesticides help prevent beetles and other insects from feeding on the raspberry bush and causing it damage. Follow all directions on the pesticides when spraying chemicals in the garden. Prune the raspberry bush early in the spring to keep it healthy, as unhealthy portions of the plant are more likely to attract damaging insects and beetles. Bailey Shoemaker Richards is a writer from Ohio. She has contributed to numerous online and print publications, including "The North Central Review." Shoemaker Richards also edits for several independent literary journals and the Pink Fish Press publishing company. She holds a Bachelor of Arts in creative writing from Ohio University.